Transport aircraft were aircraft employed to transport men and equipment by air. They were rarely armed and differed from their civilian counterparts primarily by sacrificing creature comforts for carrying capacity. Transport by air is the most expensive way of moving men and supplies, but it is also the fastest. In the far reaches of the Pacific, where rail and road nets were almost nonexistent, it was often the most flexible form of transport as well. A C-47 could transport 28 men a thousand miles (1600 km) in under six hours and still have fuel to return to its base. However, this sortie would consume a thousand gallons of aviation fuel. The Allies made extensive use of transport aircraft to supply troops. 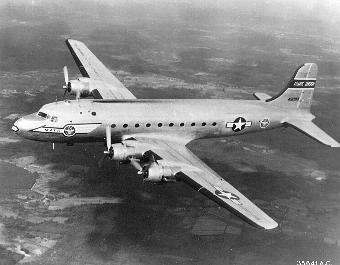 The largest such operation was the effort to supply China over The Hump, but transport aircraft were also used extensively in Burma and the Pacific. Transport aircraft were used to rush 400 tons of 81mm mortar shells to Okinawa after kamikazes destroyed Logan Victory and Hobbs Victory at Kerama Retto, creating a shortage of the projectiles. The Japanese also made use of transport aircraft, but not nearly to the same extent as the Allies. According to Japanese veterans interviewed by Collie and Marutani (2009), Japanese Navy troops dropped a small amount of rice along the Kokoda Trail on their own initiative, but organized air resupply was a rarer phenomenon. Transport aircraft were often pressed into service to evacuate the wounded. This contributed significantly to the low mortality rate among Allied soldiers who were not killed outright by their injuries. The Allies made extensive use of air drop to supply forward units that did not control a landing strip. Various delivery systems were tried, ranging from wrapping the supplies in heavy padding and dropping at the lowest possible altitude and speed to providing each pallet of supplies with large parachutes similar to those used by paratroops. The British experimented successfully with the use of jute parachutes that were not as effective as silk but cost 1/20th as much. Japanese air drop was uncommon and seems to have been limited to such supplies as bags of rice.